It’s 3:30 am on a Tuesday and I have self-diagnosed myself with the plague. Or bronchitis. And/or a sinus infection. I haven’t slept for more than an hour straight in days, and “sleeping” means “propped up on the couch”. My sides ache and my throat is sore from coughing. However, despite these symptoms I have been denied antibiotics because I have not been miserable long enough. I am told that I must be miserable at least 10 days in order to get medicine. I understand there are issues about overuse of antibiotics, but you’d seriously think I was trying to score oxycontin the way they act at the doctor’s office. It’s like the soup Nazi on Seinfeld: “no medicine for YOU“. Meanwhile, I wake up retching because I am drowning in my own phlegm. The good news is, E happily potters off to the store fetching ginger ale and tissues, and politely looks away when I’m throwing up. Of course, it’s inevitable that in a few days the table will be turned; he’ll be the one moaning on the couch while I make the grocery store runs. Make no mistake about it: love is not princes on horses or princesses with tiaras. It’s cheerfully running errands when the other person has lost the will to live. Meanwhile…I have been trying to knit this shawl for weeks and I have only managed to look at it for the past couple of days. I’m not a shawl person really, but I liked that the design totally reflects those rain showers we get, where it starts with a slow pitter pat of raindrops, so slow you could count each drop, then builds a little bit more, and a little bit more until it is pouring out. 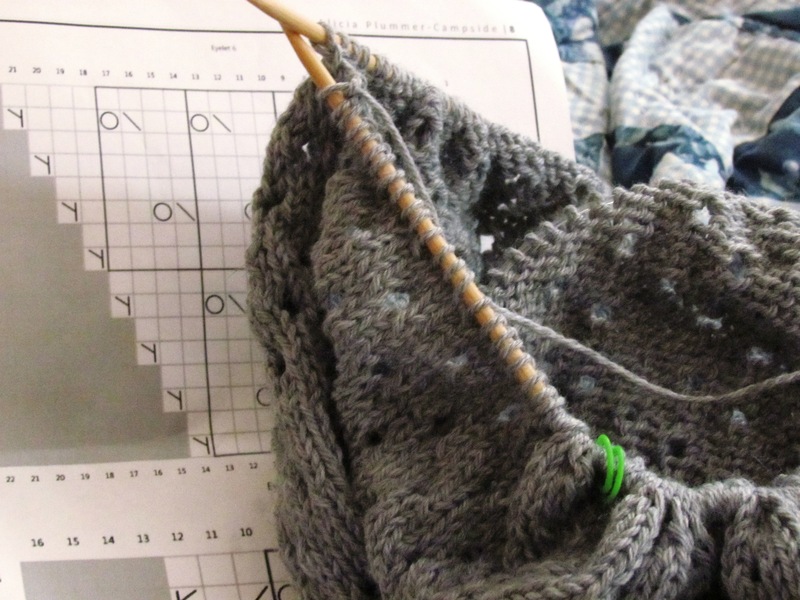 I’ve finally got to the “it’s pouring out” part, which means there are well over 300 stitches on my needles and completing each row feels heroic. It’s not really a difficult pattern but I have managed to screw it up several times. Since I plan on wearing it more as a neck warmer than an actual shawl I’m okay with the fact that some of my rows are off-pattern, no one will know without some careful scrutiny. I also made another concession and used an acrylic/wool blend for the yarn (Berroco Vintage, in Smoke)…I really am not a fan of acrylic, but from past experience I know that I’m going to want to be able to throw this into the washing machine if necessary. Here’s a show I’d like to pitch: a bunch of middle-aged people suddenly realize they have superpowers. Instead of standing over the oven trying to decide if the whole chicken they bought is fully cooked, they could use their X-ray vision. Or instead of having to mediate the cats fighting over who gets to sleep on the heating vent, we could use our powers to heat up another spot in the house. Car repairs could be done with the snap of a finger, and all household chores could be completed a la Samantha Stevens on Bewitched. And there would, of course, also self-healing superpowers, in order to bypass the Gatekeepers of the Antibiotics (however necessary they may be). Honestly, at the moment, short of winning the lottery I can’t imagine anything better. Lori is plotting to take over the world one essay, one quilt, and one hand knit sock at a time. This entry was posted in Uncategorized and tagged Health, Knitting, Netflix. Bookmark the permalink.